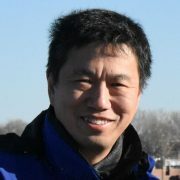 Yongguang Zhang is a Principal Researcher at Microsoft. He was a Research Manager for the Wireless and Networking group at Microsoft Research Asia from 2006 to 2015, where he and his team has built up one of the best networking research groups in the world. Previously, he was a Senior Research Scientist at HRL Labs, and co-PI/technical lead in several DARPA-funded networking and wireless research projects. From 2001 to 2003, he was also an adjunct assistant professor of Computer Science at the University of Texas at Austin. He received his Ph.D. in computer science from Purdue University in 1994. His research interests span across systems and networking, including mobile, wireless, internet, data-center networking, software radio, ad-hoc, satellite, cellular, security, network systems and hardware. He has published over 50 technical papers, including top conferences and journals of his fields (SIGCOMM, MobiCom, MobiSys, ToN). He has won a string of Best Paper Awards at top networking conferences: NSDI’11, CoNEXT’10, and NSDI’09, and 5 Best Demo Awards in at MobiSys’07, SenSys’07, MobiSys’08, NSDI’09, and SIGCOMM’10. He is an Associate Editor for IEEE transactions on Mobile Computing, an Area Editor for MC2R, was a guest editor in an ACM MONET Journal, and has organized and chaired/co-chaired several international conferences, workshops, and an IETF working group. He is a General Co-Chair for ACM MobiCom’09. He is an IEEE Fellow.